The dramatic expose of how the University of Oregon sold its soul to Nike, and what that means for the future of our public institutions and our society. Hunt uncovers efforts to conceal university records, buried sexual assault allegations against university athletes, and cases of corporate overreach into academics and campus life—all revealing a university being run like a business, with America’s favorite “Shoe Dog” calling the shots. Nike money has shaped everything from Pac-10 television deals to the way the game is played, from the landscape of the campus to the type of student the university hopes to attract. More alarming still, Hunt finds other schools taking a page from Oregon’s playbook. Never before have our public institutions for research and higher learning been so thoroughly and openly under the sway of private interests, and never before has the blueprint for funding American higher education been more fraught with ethical, legal, and academic dilemmas. 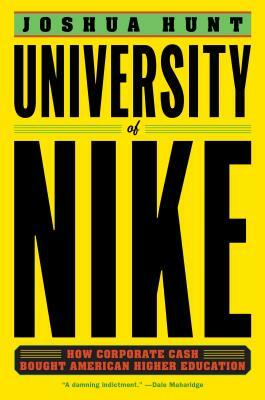 Encompassing more than just sports and the academy, University of Nike is a riveting story of our times. Joshua Hunt is a former foreign correspondent for Reuters in Tokyo. His work has also appeared in the New Yorker, The New York Times, Bloomberg Businessweek, The California Sunday Magazine, and The Atavist Magazine. He is a graduate of the Columbia University Graduate School of Journalism, where he was a fellow at the Toni Stabile Center for Investigative Journalism and a recipient of the Lynton Fellowship in Book Writing.